By now you've probably seen Hulk Hogan vs. Kim Jong-il, and you know all about Albert Einstein vs. Stephen Hawking, right? Or Abe Lincoln vs. Chuck Norris? 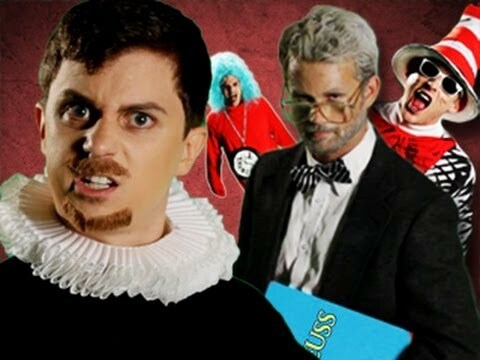 Well, maybe you haven't yet taken in Epic Rap Battles of History #12 in which Dr. Seuss (assisted by Things 1 & 2) tries to take down William Shakespeare. If you're not one of the 7.2 million viewers who've watched it in the two weeks since its posting, head on over to Youtube right now to view the latest in this entertaining series by Nice Peter who is, according to his Facebook profile, "one guy, with one guitar, with one red lightning bolt strap."